Imperial Tours combines the highest levels of quality with locally specialized, luxury touring services in China. Our company was founded by Westerners who have lived in China for over a decade. A bilingual, China-based Western Host accompanies each trip, whether it is one of our group tours or a private customized holiday. Our China Hosts act as “traveling concierges” and help translate the exotic mysteries of China while ensuring the excellent quality and service expected by luxury travelers. We eschew the “ordinary” and the tourist traps, never taking our guests to commission-paying restaurants or shops. Rather, we give you an exclusive insider’s look into what China has to offer. For example, would you rather visit a section of the Great Wall just outside of Beijing that receives a mind-numbing 10,000 visitors a day, or would you prefer to go further afield where few tourists visit and enjoy a private white linen banquet atop a secluded turret on the Great Wall? 2)	Customize a private tour for only your family. Every tour we run for families with young children includes an activity book so that your kids can get the most out of China. They will be having such a great time, they won’t realize they are also learning new things about China’s history, art, architecture, people and culture. •	Go back stage at the Beijing opera and have the costumers and make up artists dress your children up as opera stars. We will then have professional photos taken of them. 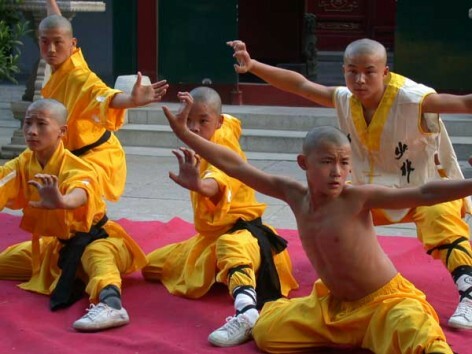 •	Watch a kung fu performance by the famous Shaolin monks. •	Take a table tennis lesson from an Olympic World Champion. •	Enjoy a bamboo raft ride, floating past the mysterious karst outcroppings in the Guilin region. •	Learn to throw noodles and make dumplings the traditional Chinese way. This is just a sample of the many unique things Imperial Tours can put together, but let us know about your family’s traveling style and interests and we will design your itinerary based on your specific needs, customizing every aspect of your holiday.